The two works reprinted here cover the early and the later periods of his career. Chinese Sketches of 1876, apparently Giles's third book, was written when he was still in the foreign service. He already revealed a stunning breadth of learning, especially for one in his early thirties who lacked virtually every Western-language reference work we all now take for granted. The Civilization of China dates to 1911, during his Cambridge years, when Giles was in his middle sixties, though he would continue to author works for two more decades down into the early 1930s. Other products of his include two still indispensable references works: Chinese Biographical Dictionary (1898) and Chinese-English Dictionary (1912). 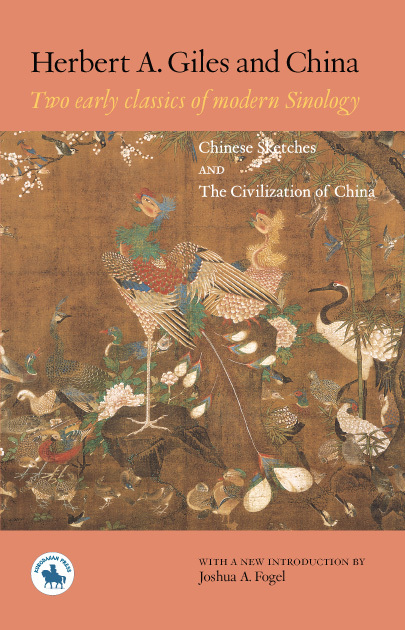 Despite the publication of a string of important and more temporally specialized biographical dictionaries in the century or more since Giles's appeared, there are still many personages from Chinese history for whom this work remains the primary and only place to find a citation. Similarly, many bilingual Chinese-English dictionaries have appeared since Giles's, but his can still be utilized to great effect. Giles also translated a goodly number of works of Chinese literature and philosophy, including Liaozhai zhiyi (Strange Stories from a Chinese Studio) and what appears to be the second full English translation of the Zhuangzi, the great Daoist text of high antiquity. He also prepared a number of pedagogical works from which to teach Chinese language and several volumes concerned with Chinese painting. He is perhaps best known as co-creator, with Thomas F. Wade (1818-1895), of the Wade-Giles scheme for romanizing the Chinese language. Long employed in the Anglophone world, it has only recently been replaced, although not completely, by the pinyin system developed in China. Thousands of books and articles written during the century it was the dominant system in use remain part of the scholarly history of the sinological field. Throughout his many books, and especially in the two books reprinted here, Giles demonstrated a deep and abiding respect for Chinese culture and the Chinese people. This position was no mean feat in the heyday of British imperialism, allegedly wide use of opium (a point which Giles disputed), and a general Western condescension toward China. In his fervent effort to make China meaningful to a foreign reading audience with much less familiarity with things Chinese than one could assume now, Giles worked hard to make sure that the often bizarre rumors then widespread about China be eviscerated and that ordinary humanity be returned to the Chinese people. Take the case of opium. To this day, scholar and layman alike assume extensive use of opium by a range of classes of people in the China of Giles's day. He argues to the contrary--and he was there--that such rumors were grotesquely exaggerated, that opium was far too expensive for the ordinary working man, and that in any event the phenomenon of opium smoking and addiction, insofar as they did exist in contemporary China, were to be favorably compared to alcohol consumption and alcoholism in his native Britain. Indeed, Giles frequently offers interesting comparisons between China and the contemporary West in which China invariably fares quite well. For example, the position of women in nineteenth-century Chinese society enjoys a poor reputation now, as it certainly did in Giles's day, but he went to great pains to demonstrate that this assessment was again exaggerated. He did not deny that the ordinary couple would prefer a male offspring, but he vehemently denied extensive female infanticide and a variety of other misogynistic practices and norms. Similarly, in an era when the Chinese were imagined to be excessively cruel in the deployment of criminal punishments--expression such as the "Chinese water torture" and "death by slow slicing" are still part of the English lexicon--Giles rejoined that the Chinese were no heathen wild men: "The ordinary Chinaman is not a fiend; he does not gloat in his peaceful moments, when not under the influence of extreme excitement, over bloodshed and cruelty." Shallow observers of the globe-trotter type, who have had their pockets picked by professional thieves in Hong-Kong, and even resident observers who have not much cultivated their powers of observation and comparison, will assert that honesty is a virtue denied to the Chinese; but those who have lived long in China and have more seriously devoted themselves to discover the truth, may one and all be said to be arrayed upon the other side. The amount of solid honesty to be met with in every class, except the professionally criminal class, is simply astonishing. That the word of the Chinese merchant is as good as his bond has long since become a household word, and so it is in other walks of life. He may himself have exaggerated in his desire to set the record straight on how much more decent the Chinese are than Westerners: "A virtue which the Chinese possess in an eminent degree is the rather rare one of gratitude. A Chinaman never forgets a kind act; and what is still more important, he never loses the sense of obligation to his benefactor." And: "From the Chinaman's imperturbable countenance the foreigner seeks in vain for some indications of a common humanity within; and simply because he has not the wit to see it, argues that it is not there. But there it is all the time." One of the most stunning aspects of Giles's respect for China in his day was his uncanny ability to separate out Western civilization from Christianity and Christian missionaries. As early as Chinese Sketches but in The Civilization of China as well, we find him extremely critical of Christian missionary activity in China. What need have the Chinese, he rhetorically asks on several occasions, for a thoroughly foreign religion when they have three of their own (Confucianism, Daoism, and Buddhism; four if Islam is added). In any event, he basically believed that the Chinese were not a highly religious people, although they were, troublingly, a superstitious people. This distinction is not made as clearly as we might now want it to be, and in addition he later argues that Confucianism really is not a religion. That said, he did not, as the missionaries and their supporters certainly did, believe that the Chinese needed Christianity to improve their morals--if only because he believed the Chinese were already more moral than Europeans themselves. They did, he opines, need Western civilization and science to help modernize their own ancient civilization, and that could be had without the excess baggage of Christianity. This argument is more subversive than it might at first glance appear, for in the case of both the Jesuits earlier and the Protestants later (in Giles's day), Christianity was to make whatever inroads it could in China by coupling itself to Western science and medicine. Missionaries would in effect say that one could not be acquired without the other; indeed, the Christian West produced the very science missionaries were introducing, and the two were proselytized as inseparable. Giles found such an argument utterly nonsensical--as, to be sure, did many Chinese reformers at the turn of the last century, who were anxious to have the best that modern science could offer without Christianity. Of the Chinese philosophers of the past, Giles displayed particular empathy--even affection--for Confucius and Mencius. He cites the former any number of times, often in a synecdoche, as a stand-in for beliefs of the Chinese people as a whole. In our own age, sentences beginning "The Chinese people think" would not likely be taken seriously by most readers. In Giles's day, when "national psychology" was more in vogue (even among scholars), such an approach was considerably more popular--even if he surely did not believe that each and every Chinese man and woman followed the exact same belief system laid out 2,500 years ago by Confucius. For Mencius, Giles evinced even more affection. He is quoted favorably on many occasions, and not least his famous views on the popular "right of revolution." When he is discussing more mundane topics, Giles is arguably even more interesting to read, for in fact many of the customs and practices he witnessed and described can no longer be found in China. Such topics would include: Chinese theater, Chinese sports and games of chance, taxicabs and fingerprinting (both of which he credits the Chinese with inventing), printing, children and family, marriage practices, law and the administration of justice, and contemporary education. He has, in addition, extensive sections in these works on premodern Chinese medicine, the origins of family names, coinages, public and religious festivals, and a whole host of other topics. Giles was also an extremely perceptive viewer of the importance of the written word to the Chinese people. He describes in both books the custom of never discarding--and, in fact, retrieving from the roadways--any pieces or scraps of paper on which Chinese characters had been written, placing them in special baskets, and then on specified days taking them to certain temples to be be burned as offerings. This practice was observed and recorded by a small handful of genuinely literate (in Chinese) foreign observers, and it marks a telling cultural threshold on the capacity of these outsiders to penetrate China and Chinese culture. Giles was writing in the last years of the Qing dynasty. Chinese Sketches appeared when the early Westernization reforms following the Taiping Rebellion were underway, and The Civilization of China was published on the eve of the 1911 Revolution, which would topple the Qing and the imperial system itself. The latter was also an era of intensive reform efforts, wholeheartedly commended by Giles, in which the Qing was making strides toward transforming itself into a constitutional monarchy. In the middle of the later work, he noted: "With the definitive establishment of the monarchy, two hundred years before the Christian era, a system of government was inaugurated which has proceeded, so far as essentials are concerned, upon almost uniform lines down to the present day." Little did he know that shortly after his book appeared in print the Qing dynasty and imperial rule would come to its final rest. Or perhaps he had a premonition of it, which may help explain the frequent citation of Mencius and China's domestic roots of "democratic" (not his word) thought. He did explicitly point out that he saw the roots for the late Qing reforms toward constitutionalism in Mencius's belief in "people first" (his words). The finest thing as a scholar that can be said about Giles's two volumes--roughly 125 and nearly 100 years after their initial publications, respectively--is that one can still read them today to great profit. The same may be said of a small coterie of Western sinological autodidacts, including Joseph Edkins (1823-1905) somewhat earlier and Richard Wilhelm (1873-1930) and Robert van Gulik (1910-1967) somewhat later: men whose work is now usually ignored--to our detriment--as scholars and observers of China in their day. The republication of these two works by Herbert A. Giles will, it is hoped, modestly redress the balance. Joshua A. Fogel holds the Canada Research Chair in modern Chinese history at York University in Toronto. He obtained his doctorate in history from Columbia University in 1980. He has also been a visiting professor at Kyoto University, and from 2001-2003 was a Visiting Mellon Professor at Princeton. Dr. Fogel's extensive publications have been almost entirely devoted to Sino-Japanese cultural relations. He is the author of five books, nine edited volumes, and eleven volumes of translation. His present research interests include a study of the Japanese community of Shanghai from 1862 through the end of World War II and a study of the place and understanding of Japan in Ming-Qing China.